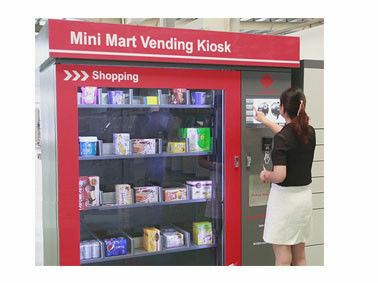 Winnsen’s Mini Mart Vending Kiosks is a highly secured and more flexible retail vending machine. We provide vending Kiosks and machines hardware, software, as well as management system, which helps you reduce operation cost and increase sales revenue. 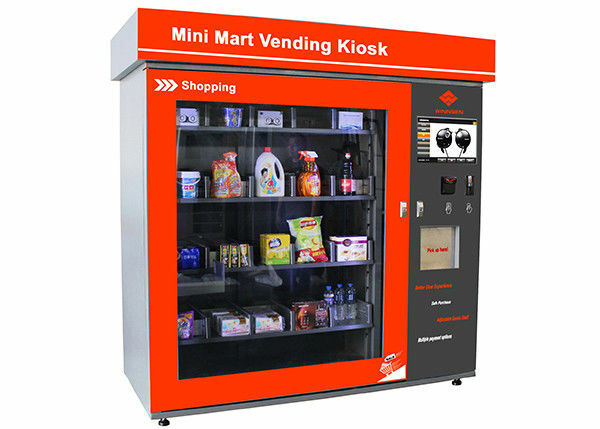 This automated retail coin bill card operated touch screen Mini Mart Vending Kiosk Machine Station is equipped with industrial computer system, 19 inch touch screen, coin acceptor, bill acceptor, card reader, intelligent elevator, electronic door, as well as adjustable channel system. This Vending Kiosk could sell different type goods, and you could adjust the channel width to accomodate different size packages, which makes it can be used in nearly all public locations. Software Options Report function, remote control system, stock management background and etc. • We can custom different language on user interface for you, it is also with option to display multi languages at the same time. Users could choose their native languages before purchase. This feature makes Winnsen vending Kiosk machine especially popular in international locations such as airport, international exhibition, large events and etc. It will increase your sales dramatically. • Nowadays interactive touch screen makes the world totally different. Winnsen vending Kiosk machine is with 19 inch touch screen to display operation instructions and goods information in both texts and pictures. With quick and prompt response from touch screen, users from different countries all like to purchase on Winnsen advanced vending Kiosk. It offers user an excellent user experience, welcomed by those high end locations. • Adjustable channel on Winnsen vending Kiosk machine helps you increase sales apacity, while reduce operation cost to the most. No matter you want to sell food, drink, cigarette..., as long as their package size is between 40 x 40 x 40 mm and 250 x 300 x 150 mm, you can put all of them on Winnsen vending Kiosk machine to sell. • Apart from making income by vending function, you can also make income by selling advertisement on optional 19 inch LCD Display. This function attracts more people to purchase, to some extent, it helps you increase sales too. • Intelligent elevator takes out goods, and electronic door with unique safe anti hand-nipping function, both bring you a fresh feeling. Quick and easy operation. • Winnsen vending Kiosk machine offers report function to help you analize daily/weekly/monthly sales for your future business plan reference. • Winnsen Mini Mart Kiosk machine could be managed remotely via internet, by LAN cable, Wifi, 3G or what ever other solutions available.